Based on historic Highlander weaponry, the Red Gem Thistle Sgian Dubh features a silvery Scottish thistle emblem upon the center of its handle. A deep red gemstone inset at the pommel adds a regal touch to this replica dagger. The blade of this Scottish knife is made of stainless steel, and light serration appears on the back of the blade near the hilt, adding utility and detail. 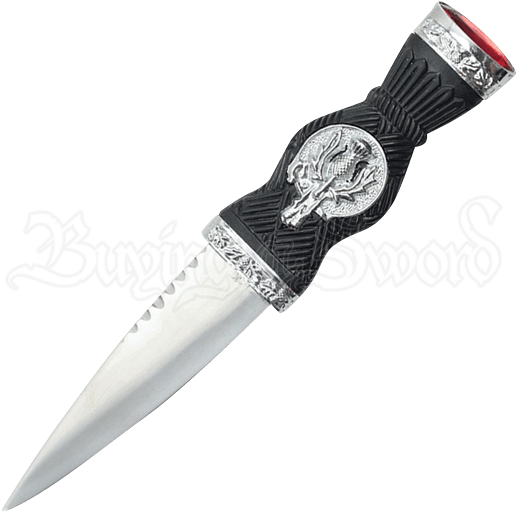 Framed on the top and bottom with silvery thistle patterned bands, the black composite hilt features grooves and lines surrounding the emblem and creating a firm grip. The oval shaped red gemstone appears encased by one of the silver tone bands. With an included black composite sheath decorated with matching silvery thistle detail, the Red Gem Thistle Sgian Dubh is a replica Celtic knife ideal for Highlander themed reenactment events. Beautifully designed and emblazoned with a token of historic Scottish heritage, this stainless steel knife is also great for collecting, displaying, or giving as a gift.